Another week and another edition of Ready For The Weekend. So without further ado, lets get started. On Friday night, Discovery Wrestling are making their debut at the Portobello Town Hall in Edinburgh with a card stacked with British and international talent. One match containing both talent from our shore and overseas is Chris Hero vs Joe Coffey. Hero is probably one of the most respected wrestlers in his native USA and all over the world. Joe Coffey is quite simply the Iron Man. A hard hitting, non-stop machine of a wrestler. Chris Hero is known as The Knock Out Artist. It might very well take a knock out to stop Joe Coffey. Also set for July 31st is the rematch between Damian O'Connor and Rampage Brown. We will need to hope that the Portobello Town Hall is well-built as when these two men collide it may destroy the very foundations of the building and only one man will be left standing after this war. One match with a great deal of interest surrounding it is the four-way elimination between Lionheart, BT Gunn, Christopher Saynt & Danny Boy Rodgers. In what will no doubt be a very competitive match, the implications that this match could have on the Y Division Championship is what really catches the eye. 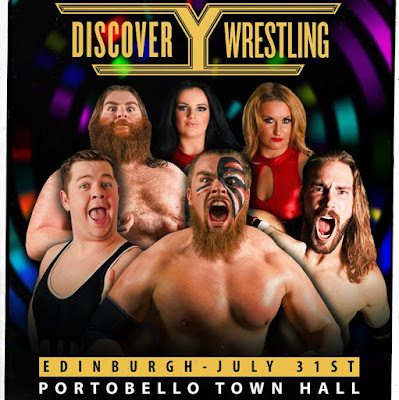 All of these matches plus contests including Viper, Kid Fite and Lewis Girvan is making Discovery Wrestling event a very worthwhile destination this Friday. 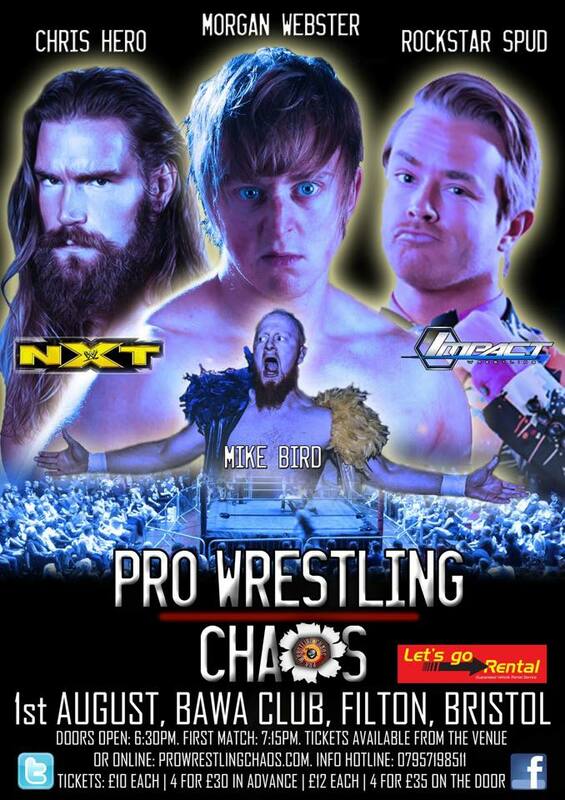 Moving on to Saturday and Pro Wrestling Chaos are at the BAWA Club in Bristol with Hell Is For Heroes. 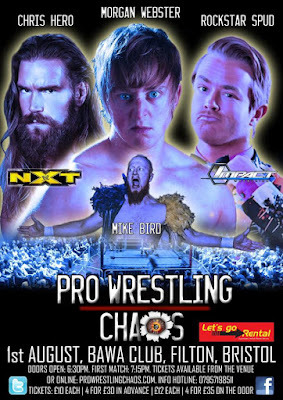 Sitting right at the top of the card is Mike Bird defending the King Of Chaos Championship against the returning Mark Andrews. Mike Bird has had great year in PWC with successful championship defences against the best that Pro Wrestling Chaos has to offer. However Mark Andrews is on top form right now, wrestling all over America. Not to mention that Mark Andrew probably knows Mike Bird better than anyone, as Bird helped train Andrews many years ago. Mike Bird has defeated the best, he'll have to beat Andrews in his best form to keep the championship. Speaking of best form, Rockstar Spud who is having the best period of his career so far will also be in action on August 1st when he competes against Damian Dunne and the most hated man in Pro Wrestling Chaos, 'Flash' Morgan Webster in a triple threat match. Another match set for this Saturday in Jeckel facing Rampage Brown. Jeckel has had a hell of a year in Chaos, defeating the likes of Mikey Whiplash in 2015. His confidence is at an all-time high as he personally challenged Rampage Brown for this match. Brown has never back down from a fight in his life, this will be no different. Also in action will be Chris Hero against Eddie Dennis, The Hunter Brothers in tag team action and The Doomsday Killers open invitational. 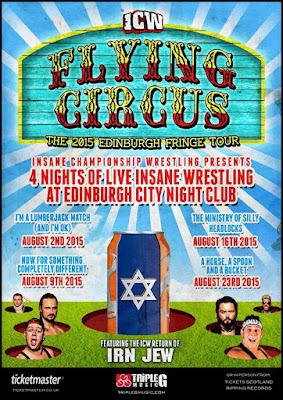 Sunday will see Insane Championship Wrestling begin their four week tenure at the Edinburgh Fringe Festival. The first show, 'I'm A Lumberjack Match (And I'm Okay)' will give a tiny glimpse at the carnage that awaits at 'Fear & Loathing VIII' when Legion's Mikey Whiplash competes against the New Age Kliq's Wolfgang. Speaking of the New Age Kliq, Chris Renfrew and BT Gunn will be in action against the Sumerian Death Squad's Tommy End & Michael Dante with the winner being named the number one contenders to the ICW Tag Team Championship. In the fallout from the main event of 'Shug's Hoose Party II', one of the men responsible for costing Damo the ICW World Heavyweight Championship, Jack Jester will face the wrath of 'The Beast Of Belfast' when the two meet this Sunday at the City Nightclub. 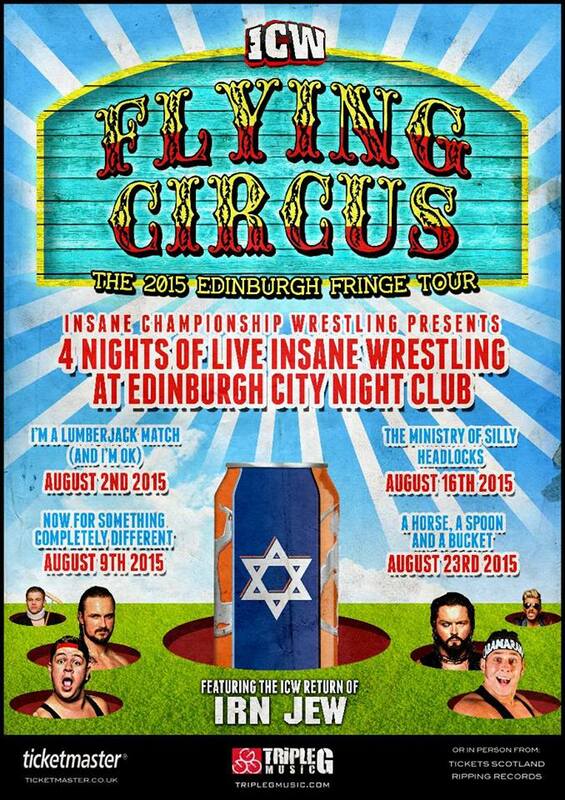 Add in matches with Noam Dar, Kid Fite & Joe Coffey and it looks like ICW are kicking of their residency in the Scottish capital in style. That wraps up this week's preview of the weekend's wrestling schedule.